For a long while I already have the Afghanistan Museum in my profile picks. It is a wonderful place! The journey begins at the gate. Behind it opens up a fantastic landscape. Caution: Beware the snakes! At best is to use the flying carpet and enjoy the flight through breathtaking valleys to the museum. The museum itself is in its exhibition vivid insights into the culture and especially the daily life in Afghanistan. Actually it made me greedy to visit it once. If it was not such a dangerous country - especially for women. And that's Trills main topic! She informs about the women's organization RAWA and supports it. I interviewed Trill about it: "Trill, your Grail Quest was one of the highlights of Burn2. I knew your name already from your excellent Afghanistan Museum. To me it is a good example how information and entertainment should be combined. How come you interest for Afghanistan and your huge knowledge about this country? " Trill Zapatero: "Well, it's actually a personal research project. the closest I've been to Afghanistan is the border of India with Pakistan. I wanted to choose a charity for an art exhibit two years ago, and I found RAWA. So the museum and the shop came about as a result of that. Actually, Millay Freschi at Four Bridges suggested I make a little information centre about RAWA and the museum grew out of that." "You have a special Focus on the situation of women in Afghanistan. According to research results it is for women the most dangerous country worldwide. The worst thing is that this is a result of political intervention of Germany and US back to 1979 which supported the most conservative movements in Afghanistan. What are your contacts to this country and which information do you can share with us?" Trill Zapathero: "All the research at the RAWA exhibit comes from RAWA's website as well as Amnesty international and and Human rights watch"
"So, what can we practically do to help?" Trill Zapatero: "Well, get the word out about the museum, shop at BoHo HoBo, and any other ideas you like." "You share your part to help. 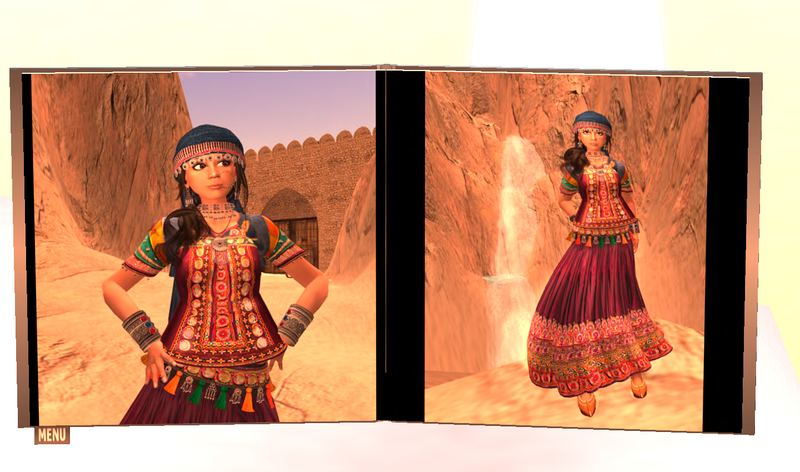 Not only with the museum, but also with your great BoHo HoBo fashion you create in SL. Tell us about it!" Trill Zapatero: "All the profits from BoHo HoBo go to RAWA, the tier is paid for by an anonymous donor, I pay for texture uploads out of my pocket. I love making clothes, coming up, I'm going to have a fashion show, hopefully as part of peacefest in November. I'll get you some images of what I have so far:"
"Thank you for the interview!" Boho HoBo is chic fashion with ethnic influences at reasonable prices. On all photos I am wearing clothes from the current collection. Every linden is spent to a good cause. So what are you waiting for girls? Horror Season Starts: Do you Dare?